Reference number for this case: 22-Sep-54-Rebais. Thank you for including this reference number in any correspondence with me regarding this case. - Near Melun, several inhabitants of the commune of Rebais saw a strange machine, very bright, circulating at night fall in the sky. They pointed out that the apparatus which circulated very slowly had then turned towards Coulommiers, having increased its speed, and had disappeared. C.R.S. also saw a luminous disc in the sky, above Vaudoy. Dole (C.P.). -- The two young Dolois, Jacky Chapoutot and André Lacour, who "saw a flying saucer" last week in Dole, noticed the same phenomenon Wednesday, around 8 pm, while they were at two different points of the city . 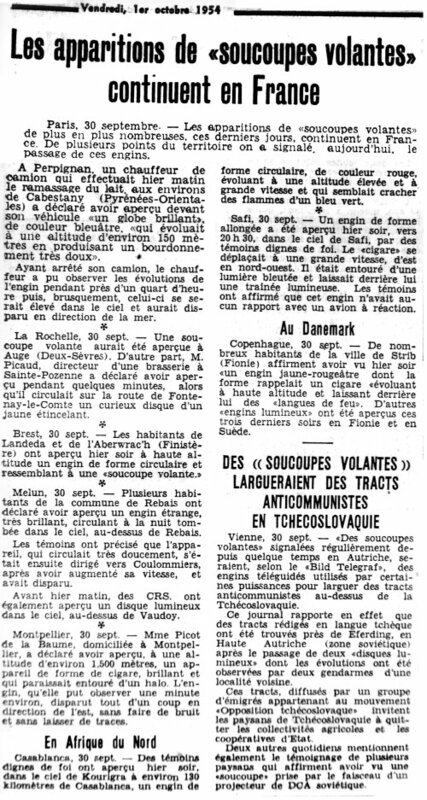 Aimé Michel reports in relation with other sightings of September 22, 1954, that there was an observation that evening at Rebais in the Seine-et-Marne. 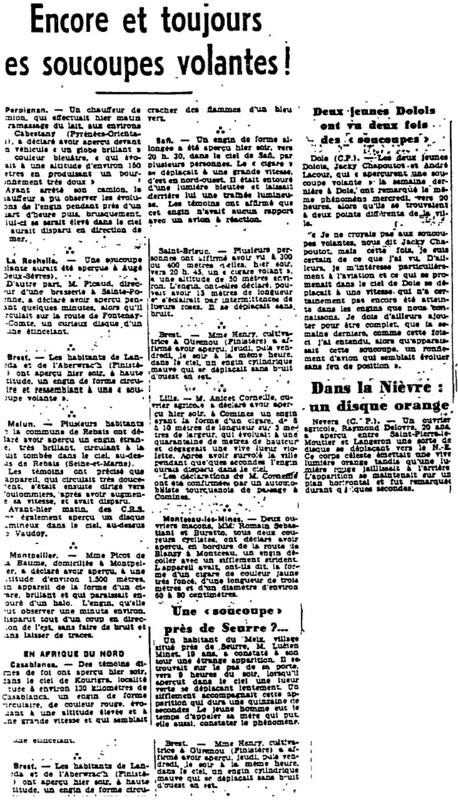 Luc Chastan indicates that in Seine et Marne at Rebais on September 22, 1954, at an unknown hour there was an "Observation of an object during the night of the 22 to the 23." 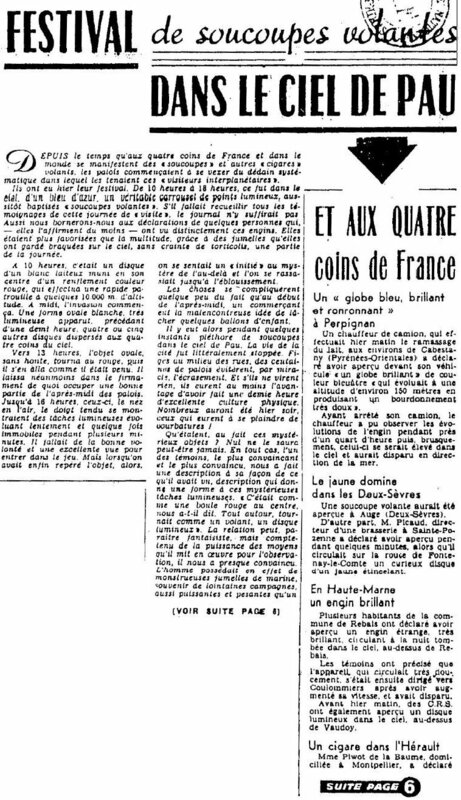 Luc Chastan indicates that in the Seine et Marne in Rebais on September 29, 1954 at an unknown hour, there was an "Observation of an object without more precision." The website indicates that on 29 September 1954 at 22:00 in Rebais, France, "An unidentified object was sighted, but with appearance and behavior that most likely would have a conventional explanation. One object was observed." [jv6] "Catalogue préliminaire de 500 observations", listing in "Les Phénomènes Insolites de l'Espace", book by Jacques and Jannine Vallée, Table Ronde publisher, France, 1966. [am1] "Mystérieux Objets Célestes", book by Aimé Michel, Seghers publisher, France, page 92, 1958. [jv6] "Catalogue préliminaire de 500 observations", listing in "Les Phénomènes Insolites de l'Espace", book by Jacques and Jannine Vallée, Robert Laffont publisher, France, page 249, 1978. [lg1] "UFOs: A History - 1954 - September", monography by Loren E. Gross, USA, page 49, 1991. 1.1 Patrick Gross February 18, 2010 Additions [lc2], [ud1]. 1.2 Patrick Gross May 28, 2010 Addition [la1]. 1.4 Patrick Gross July 26, 2010 Addition [vm1]. 1.5 Patrick Gross December 8, 2016 Additions [lg1], [ub1]. 1.6 Patrick Gross December 22, 2016 Addition [pr1]. 1.7 Patrick Gross January 20, 2017 Addition [er1]. 1.8 Patrick Gross February 22, 2017 Addition [tr1].